CHICAGO – As the classification of “cult hit” becomes a progressively mainstream notion considering the multitude of “The Room” screenings across our great nation every weekend or the universal quotability of “Troll 2,” “The Guest” arrives. It is a movie made with the degree of madness often found only at midnight, usually at film festivals, or during special events at indie movie houses like Chicago’s Music Box Theater. And yet, through the ascending career of former Joe Swanberg collaborator Adam Wingard, it is gloriously opening without the cult following previously installed, groomed to unleash bloody hell on viewers who have set ideas either on the sweetness of “Downton Abbey” star Dan Stevens, or even what an action/horror film can currently offer. A contagious crux of the movie’s glee, Stevens has a visible and absurd amount of fun with his title character, a hilariously perfect cartoon of masculinity and the American war machine. Often his smirks are on full-display for the movie’s welcome heavy winks whenever he picks up a sharp object (boosted by a sound design with a sense of humor), or has used his imposing niceties on those who stand in his path. “The Guest” is accelerated by efficient 80s nostalgia. It is possessed by the spirit of the action and horror films that Wingard would be first to name-drop when discussing the invention of “The Guest,” but it does not date itself with specific references as contemporary nostalgia. Instead Wingard’s film is a celebration of a decade that didn’t successfully follow the high achievements of the 70s in regards to overall quality, and is often perpetuated by those who adore the decade’s lesser products (like with Jim Mickle’s recent “Cold in July,” or Troma alum James Gunn’s “Guardians of the Galaxy.” In “The Guest,” ominous jagged synths warble to create intentional cues of terror, while its whimsical side is articulated in a soundtrack reminiscent of the 80s aesthetic achieved in Nicolas Winding Refn's “Drive.” There’s other 80s stimuli as well in the storytelling as well, including rough high school bullies, and comically gratuitous hot bodies. As a film that does promise chaos down the road, “The Guest” remains zealously restless to the expectations put upon it. For those who expect the film to be as docile as its first two domestic acts, it becomes rollicking and sharp; similarly, those geared up for violent gratuitousness are confronted with horror that has humanity for its characters amongst vivid action spectacle. An exquisitely twisted ambassador from a burgeoning scene of cult hits and midnight madness, “The Guest” has a distinguished offering of mainstream chaos, one that is sufficiently classic and new all at once. Similar to the experience of viewing an unseen film at a festival, “The Guest” benefits greatly from its unfamiliarity, as the story nicely nestles in on its own terms. With that, I will tactfully try to tease: Stevens plays a discharged soldier named David, who arrives at the doors of the Petersons, a family whose recently-deceased son Caleb served with David, or so he claims. As he moves into their living space, armed with only his incredible charm and physical presence, David soon becomes involved with the drama of the family. He acts as father figure to bullied young son Luke (Brendan Meyer) and a protective weird friend to daughter Anna (Maika Monroe). He wins over the heart of the broken mother Laura (Sheila Kelley), and boosts the emasculated father Spencer (Leland Orser). But as David’s time at the house continues, his intentions are questioned, as his low-key perfections lead way to much darker impulses. 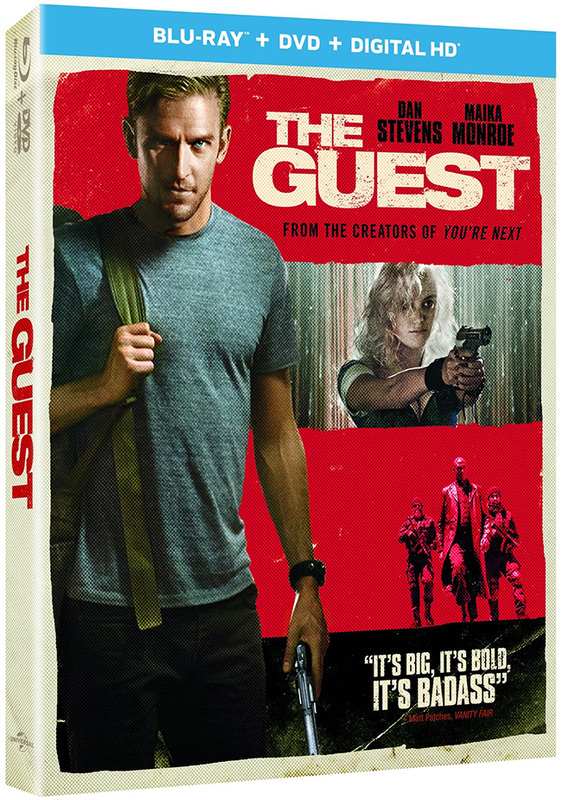 ”The Guest” was released on Blu-ray and DVD on January 6, 2015.